After a 16 year manhunt, Bosnian Serb war crimes suspect Ratko Mladic has been transferred to the United Nations tribunal for Yugoslavia at The Hague. 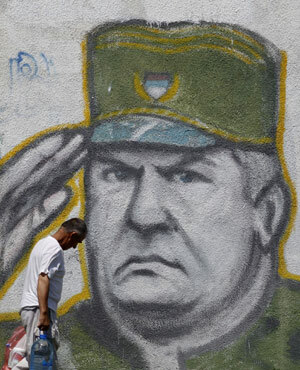 Mladic, a Bosnian Serb, has previously been indicted for war crimes, crimes against humanity and genocide. He was allegedly responsible for ordering the mass killing of 8,000 Muslim men and boys at Srebrenica in July 1995. According to the indictment, Mladic committed these and other crimes as part of a joint criminal enterprise whose objective was to eliminate or permanently remove Bosnian Muslim, Bosnian Croat and other non-Serb inhabitants from large areas of Bosnia and Herzegovina. His arrest was welcomed by the international community. "These victims have endured unimaginable horrors...and redress for their suffering is long overdue," said Serge Brammertz, chief prosecutor of the ICTY, after the arrest. In a release, the ICTY said that the UN Detention Unit where Mladic is detained meets the highest international standards for the treatment of detainees. It said that following a full medical examination by the Detention Unit's medical staff, Mladic's health will be continuously monitored and any treatment required will be provided. His initial appearance will be announced in due course.